The Great Wall of China, like the Pyramids of Egypt, the Taj Mahal in India and the Colosseum in Rome etc, is one of the great wonders of the world. It lies across the northern part of China like a great dragon, winding its way through the vast territory of China stretching over 6000 km. When people think about China, the Great Wall is probably the first thing to pop out. It was listed as a world cultural heritage by UNESCO in 1987 and has become a national icon of China. Since the Great Wall is very long, there are different sections of the wall opening to the public. The most famous and best preserved sections are Badaling and Mutianyu. 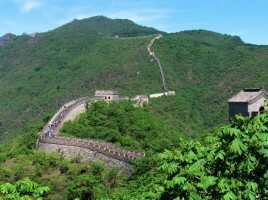 Juyongguan is one of the most important passes of the wall. Simatai and Jinshanling are more primitive. Why was the Great Wall built? 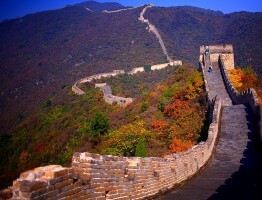 The Great Wall was first built during Spring and Autumn Period of China(770BC-476BC). At that time, China was divided into many small states. In order to protect their territory, they built beacon towers and connect them with walls thus forming the earliest Great Wall. In 221 BC, Emperor Qinshihuang united China, rebuilt and joined the former wall to make a complete fortification, known as the Qin Great Wall. Though the Qin Great Wall remains little today, it is the most famous in the history. Starting out in the east on the banks of the Yalu River in Liaoning Province, the Wall stretches westwards for 12700 kilometers to Jiayuguan in the Gobi Desert, thus known as the Ten Thousand Li Wall in China. The Wall climbs up and down, twists and turns along the ridges of the Yanshang and Yinshan Mountain Chains through five provinces-Liaoning, Hebei, Shanxi, Shaanxi and Gansu and two autonomous regions- Ningxia and Inner Mongolia. There stand 14 major passes(guan, in Chinese) at places of strategic importance along the Wall, the most important being Shanhaiguan and Jiayuguan. Yet the most impressive one is Juyongguan, about 50 kilometers northwest of Beijing. Is the Great Wall visible from the space? “The Earth looked very beautiful from space, but I did not see our Great Wall,” said China’s first astronaut, Yang Liwei, after 21 hours in orbit in October,2003. The comment triggered a round of news stories that implied the structure could not be seen by any astronaut, disappointing many Chinese who thought it was the only man-made structure visible from space. Due to the very long distance between the earth and the spacecraft(350 km-400 km) and the resolution of the naked eyes, people from the space would recognize the objects that are over 200 m wide. However, most part of the Great Wall are less than 10 m wide. Therefore, it is very difficult to recognize the wall from the space. However, do not forget about the shadows. In a particular situation, with the sun shining, there may be shadows of the wall over 200 m. It is still possible to see the Great Wall from the space. However, so far no one has proved that. People may tend to think that the Great Wall was a product of wars, and its history is filled with battles and blood-shedding. However, it is not the truth. Actually, the Great Wall brings peace rather than war. The Great Wall is one of the greatest military defense in ancient world. It is not just a wall, it comprises walls, passes, fortresses and beacon towers, creating a complete military defense system. In the era of cold weapons, the Great Wall defense system is highly effective. Even if the invaders break through one or two passes, it is very difficult to go further or go back home because they will be surrounded by the troops and the supply will be cut down. Therefore, it is difficult to shake the reign of the emperors as long as there are troops guarding on the Great Wall. Click here to view the travel tips for the Great Wall. The Great Wall is definitely a must-see attraction in China. If you would like to take a tour, please contact us to customize your tour.